Man that's great! Must have been quite tricky to get the shape! That is a spooktacular pumpkin! Very cool! I love it! This really is creative and very well done. Congrats! Way cool! Very good job on it! Woah! That is really cool! I should do something like that. @fred - it wasn't too bad, but it did take a bit of time. 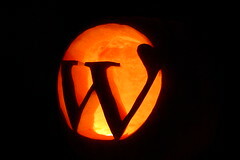 And I thought I was cool with my WordPress t-shirt... fantastic job! spooky. i like the crash of old and new technologies--writing by carving on objects is transported in time and space via photography and the internet to laptops everywhere! Nice! 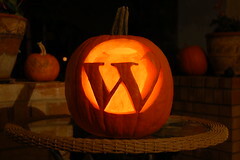 That's an unique pumpkin carving, I bet your neighbors will wonder the meaning of "W". After seeing your pumpkin, mine has now become pie. That's awesome Eric. 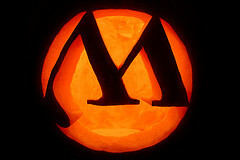 Beats my Union Jack-o-Lantern. 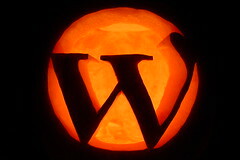 Nice carvings of the WordPress logo on the pumpkin. aaahhh!!! Very nice...and creative too. Dude, that is awesome! I thought you said you were more of a programmer than a designer. Whatever. That rocks! Did you ever launch that new design for your family's blog? ^D awesome, how long does it takes? @all - thanks again for the comments. @Steve - pumpkin pie is yummy! @Brandon - thanks ;) The design was actually for this site and unfortunately I've been too busy lately to work on it. How's the hiatus going? WhOa! Came across this from the dashboard ... someone has some patience and a little talent! Nice to see some pumpkins ... none here in Sweden lit up on this dark rainy Halloween night in Stockholm. Too cool!!! Hate to ask if you have any tattoos? As former EVP/Editorial Director of Martha Stewart, I am professionally qualified to give you two thumbs up on the pumpkin-carving. Fabulous. You'd do Martha proud (and upside-down, it's her initial...or mine). As a WordPress user and believer (as is Martha), I say another two thumb's up for showing your passion for this great technology. I wonder what you'll be carvin' out on a pumpkin(or ice) this coming holidays. What does that stand for? "Witches'... brew"? wow man... that's very cool. hahaha this is nice, I am definitely gonna have to do this next year. I can see it now, people going wtf!!?? hahah nice. Thanks for the info. 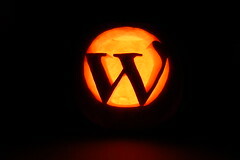 BLOG.NICASIODESIGN.COM » Getting into the Halloween Spirit!